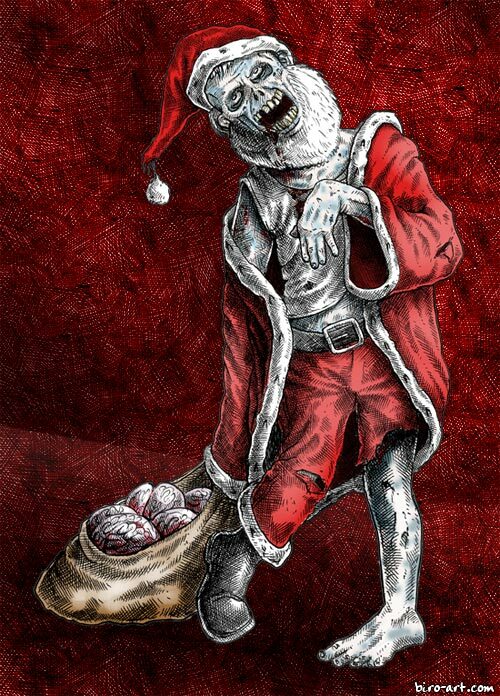 Have a scary Christmas Frightners!!! The Zombie Night Before Christmas! 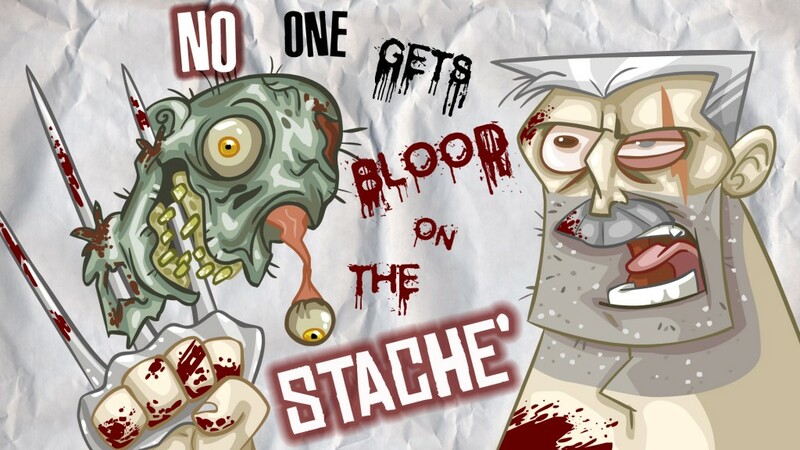 Here is a great classic re-written by Scary Jane for all of us zombie fans out there! Enjoy!!! As the virus mutated to make her mad as a hatter. Ran down the street moaning, covered in a rash. Seeking to quench her new hunger for brains. But a group of carolers singing with cheer. Soon the whole group was lying there dead. They now also wanted some brains they could eat. Zombies ruled the town and everything in sight. They surrounded the town and protected their flanks. Bit the arm of a soldier, and made him get sick. And soon the army base was totally wrecked. All failed to stop the bloodthirsty fiends. 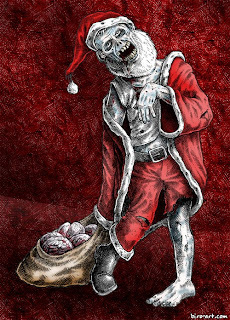 Then down from the sky St. Nicholas came with a bound. And he looked like an action hero ready to attack. His cheeks were like roses, his aim second to none! 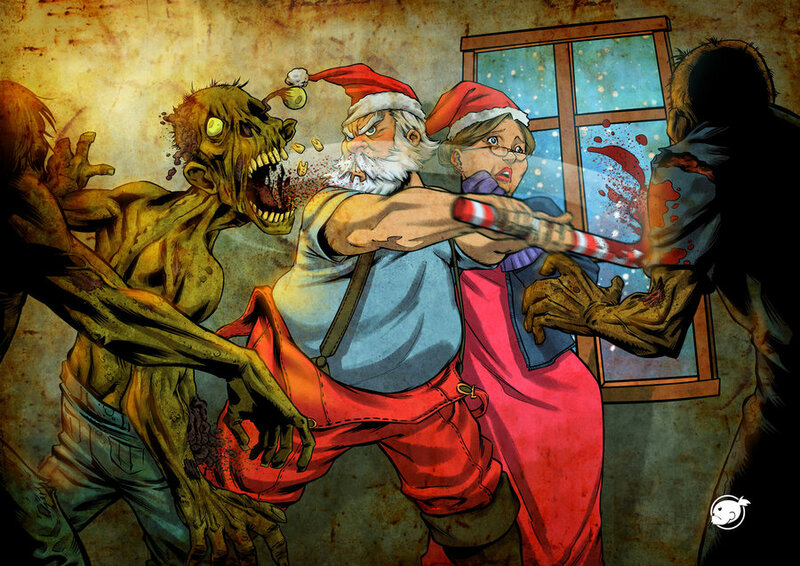 And his axe cut through zombies like jelly. Taking some time to develop. I know it's been a few days if not weeks since my last post and I just felt I should chime in. I am still here and have some drafts written that I need to finish before I start posting again but I've been pretty busy as of late with last minute holiday shopping and preparations so I have been slacking a bit on the blog so I do apologize and promise more is coming! Yes you will just have to wait for it haha! I am sorry...let the boos start now but we really want to wait until the logo design is complete and the website is more presentable. What I can promise is is that at Hauntcon this year we will all be there in force with flyers, T-Shirts, Business cards and more to promote our haunt which we have also named as well as promoting our company. Dave, Rich, Johnny and myself have all been working hard on every aspect of our haunt design. A full business plan is being drafted by Rich. Dave is creating a full 3D layout of all 3 haunts...yes 3 haunts in one! And myself and Johnny are developing all of the logo design as well as renderings of each of the 3 facades so needless to say we have been BUSY! There may be a few more days between each post in the coming month but I assure you I am here and working hard to bring you some cool new updates and content. Hopefully by next week you will get to see our first logo design as we reveal our haunt name to the haunt community. We will need to think of a cool way to do this so let us know your thoughts in the comments. Do you want us to reveal on BlogTV. Do you want a full Vlog on Youtube? Or is simple blog post cool enough? Perhaps a podcast even?? HMmmmmm....I will entertain all but if you are reading this post I would love to hear your thoughts on how you would like us to continue to update you about our pro haunt venture. We will take all suggestions under consideration and give credit where credit is due! 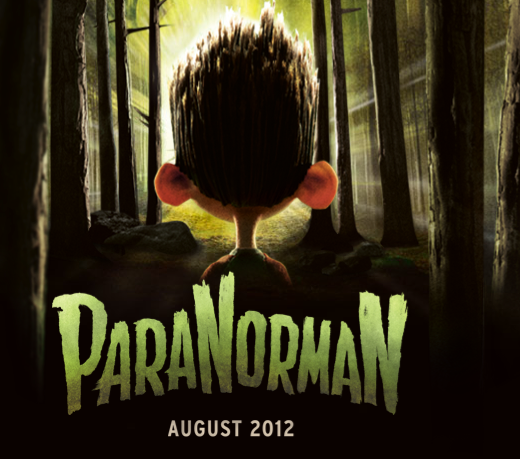 Some of you may have already heard of the new stop motion movie ParaNorman coming this August 2012 by the same makers of Coraline Laika pictures. ParaNorman is about a misunderstood boy who can speak with the dead. Norman takes on ghosts, zombies and grown-ups to save his town from a centuries old curse. Sounds pretty cool to me, I mean if there are zombies and ghosts and a century old curses how could you go wrong?! The first trailer was recently released and from the looks of it it's going to be a neat little film. If you haven't seen it yet please take a look below and keep checking the website out for future details HERE! Some quick updates on the pro haunt situation for you. In case you haven't been keeping up with any of the recent posts I am teaming up with Dr. Death of Pandemic Cemetery & GhoulishCop from Devils Eve to create a professional haunt for Secaucus High School next year. This week we took a trip to meet with our contacts at the school and discuss the entire set up process for next year and see first hand where we would be constructing our haunt and in that process we were given the biggest gift we could have ever imagined. 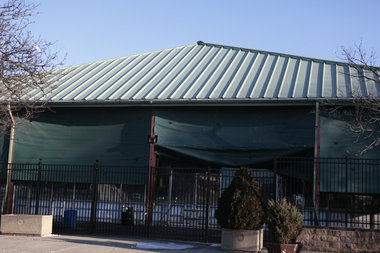 An over 20,000 sq ft hockey arena to use however we please! In the midst of our conversation the school principle Dr. Bob told us that instead of trying to work around the school schedule and the many events that go on during the week at the school which may impact and even disturb our build process he had what he thought may be a better idea and asked us if we would be willing to take a little car ride to check something out. Naturally we said sure and a few minutes later we ended up at the Secaucus Hockey Arena. Myself, Dave and Rich all looked at one another and back at the arena in shear amazement when Dr. Bob proceeded to ask us if we would like to use it to build our haunt for the school. He said we would have full access to the rink with no interruption. We could come and go as we pleased, build any day or night seven days a week and months in advance of our opening date. Of course this seemed to be a no brainer and we said absolutely! The rink not only offers a HUGE space to build the haunt we envision (and yes the ice will be covered by flooring in case you were wondering haha!) but it also gives us plenty of space for our patrons to park, an ideal location that is close to a major highway that runs in and out of New York and simply endless possibilities for marketing and more. This really is going to be a challenge for us as we couldn't have ever imagined having something so immense to use. Some pro haunts probably don't have this type of space but the trick part is using it wisely and of course filling it out. We will need to be clever as we proceed to format our plan of action and begin a virtual layout of the space for a presentation that we will be giving to both the principle of the High School Dr. Bob and potentially even the Mayor of the town who Dr. Bob believes will be very excited and supportive of this event. Tomorrow is a big planning day and you can bet I will have pictures, video and more information to share with you all. We are all very greatful for this opportunity and excited at the potential that it presents for one heck of a haunt! It's time to get to work and let the creativity begin to flow! I hope you will all continue to check in on our progress. Goooood Morning! I'm up early today putting together this mornings Vlog and of course here I am writing my blog post for today and I suppose I am getting an early jump start because today is going to be a busy and exciting day as it is the first time that I will be headed to the location of where our pro haunt will be next year to check it all out. I will be headed to Secaucus High with Dr. Death & GhoulisCop this afternoon at 2PM to take some measurements and have an initial kick off meeting to discuss the haunt for next year so I am really looking forward to that. I hope to get some more pictures and video to share with everyone and hopefully post tonight but until then lets get into some other cool stuff that we can talk about right now! Now a few weeks back I went to Cape May NJ with my wife to spend a weekend at one of our favorite little Bed and Breakfasts Elaines. I have raved about Elaine's in previous blog posts. It is a cool little B&B right smack in the heart of of Cape May. Elaine's not only features the towns only Haunted Mansion dinner theater but the B&B itself is reportedly haunted and trust me, my wife and I can share a lot of stories about that being true! Any-hoo! While we were in Cape May we usually like to take to the Washington Street Mall which is a 3 block concourse which has been around since 1972. This is the best place to walk around and take in the small town atmosphere while browsing some pretty interesting shops. If you like old antiques, cool nic nacs or are simply just looking for some good eats and drinks then Washington Street Mall is the place to go while your in Cape May. It is also a great starting place for those new to the Cape as you can visit their visitor center and book an excursion on one of their many Trolley Tours and or Horse and Buggy Rides. I suggest the Ghosts of Cape May tour or the tour of the Physick Estate which is an amazing victorian mansion with haunted past! While browsing through the shops that weekend I came across these really fun resin casted characters called Furry Bones! Furry Bones are the brain child of an artist by the name of Misaki. Misaki grew up in Tokyo and moved to LA just before her 17th birthday. While in the states she studied art and anatomy. Her interests in both anatomy an her love for Manga and Japanese Anime have been the driving force behind her Furry Bone collection. I was instantly drawn to her collection because the first thing I noticed when I saw them on the shelf were their skull faces and me being a Halloween nut and loving skulls how could you not be drawn to that! As you can tell the "Furry" in Furry Bone is in reference to the characterization of each of these little guys as they all represent a different animal of sorts. The "Bone" well of course that refers to their bone faces. 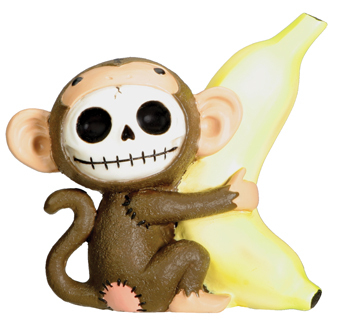 I would have loved to take each and everyone of them home that day but I decided to start my Furry Bone collection with the monkey holding a banana haha! I mean come on, it's a monkey holding a banana! I mean what's better than that haha! Well of course there are plenty other Furry Bones with their unique characteristics and charm each to themselves so it was a hard choice to just pick one but I am looking forward to adding one here and there little by little and at a modest $8.75 a piece you can easily grow your collection by leaps and bounds and fear not!, once you have them all Misaki also has an abundance of other Furry Bone Collectibles like Furry Bone plush animals, salt and pepper shakers, coffee mugs, and more! 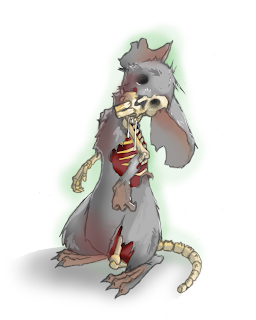 With the holidays around the corner my suggestion is a cool Furry Bones collectible for the Halloween fanatic friend, spouse or family member of yours. You can't go wrong and I promise you will love them to DEATH! Here is a video update of our pro haunt venture along with some quick clips of the school and just us BS'n at our meeting. Tomorrow will be the first time we get to see the space in person and take measurements. With those measurements we will begin to lay out the wall panels in AutoCAD and begin the design of our haunt. We spoke about potential theme ideas for the haunt and about a brand new haunt name specific for this venture so all in all it was a great time meeting with everyone and we are all looking forward to tomorrow walkthrough which I will be sure to video and provide for you all to see. Stay tuned for more updates each and every day. Pro Haunting We Will Go! Well if you haven't heard the news just yet next year I will be teaming up with GhoulishCop and Dr. Death along with my friend and design genius Johnny Cross to create an all new professional haunted attraction in Secacus NJ, name to be determined. A short time after Halloween my sister in law who works as a teacher in Secaucus High School told me about how their Junior class does a haunted high school fundraiser each year to raise funds for project graduation and prom however, next year the people who normally help produce the haunt will no longer be available to help leaving the Junior class in a bind. The principle of the school wanted to continue the haunted high but with no one with haunt experience on board it seemed to be a great uncertainty if that would be at all possible but it was then that my sister in law asked me if I would be interested. Naturally I had the instant sparkle in my eye but knowing how much time and energy would be needed to put on a quality show the likes of that they had never seen I wanted to be able to bring a team together with the know how and talent to help make this a success so I put the word out to a few local haunt buddies of mine and formed the team above and now have begun the task of developing an all new haunt for Secacus High! I'll start with GhoulishCop. I met Rich when I first attended the NJ/PA/NY Make and Take group a little over a year ago. Rich and I instantly clicked. He shared the same crazy sense of humor as I did and the insane passion for haunting. Like me he can't get enough of watching the endless haunt videos and prop tutorials on Youtube, loves working with paper mache and is a Haunt Vlogger and Blogger much like myself. We have attend a few haunt conventions together and are now working on both of our first 3 Axis skulls. I guess you can say their is a budding Bro-mance there haha! I am happy to have him on board. His skills in mache not to mention fearlessness in trying to build anything will be a great help. Next up is Dr. Death! I was first introduced to Dave by his fiance Nichole whom I went to high school with. Both Dave & Nichole attended Grimlock Manor when we first opened up and just this past year they reached out to me after learning how close by we lived to one another. I began to learn more about Dave and his insane skill at building animitronic props and prop controllers through his website Pandemic Haunt Production and shortly after that Dr. Death began his very own Vlogs on Youtube where he began to talk more about his haunt and all his creepy creations! Dave's ability to build almost any animated prop will surely lend it's hand to I am sure some pretty intense scares! Finally, Johnny Cross. Johnny has been a long time friend and past co-worker of mine in the design field. We have worked on many projects before and his design skills and knowledge run deep. Pair that with an insane love for haunted houses and horror and I am sure our marketing material will be both eye catching and fear inducing. With marketing being a key to any successful haunted house I feel confident to have Johnny on board as a key member to our haunt team. Our first meeting was yesterday and there was plenty to be discussed. We had a few pictures of the space to look over and discuss how to best utilize and their were plenty of ideas put on the table. One of the biggest notions we want to squash is that a high school haunt cannot compare to many of the pro haunts out there. When people normally think of a haunted high school they think of black plastic walls, a million strobe lights and a few cheesy scares. They also think that the only theme will revolve around a haunted high school and teachers yelling at you to get to detention or principles telling you that your expelled but we want to dissolve that way of thinking and provide an experience that no one will expect. Yes this is a haunt taking place at a high school but the environment we will put you into will be anything but a school surrounding with ghoulish teachers yelling at you. We want to create a nightmare that you won't soon forget! The months to follow will all be exciting as we continue to develop our haunt, create an identity and work towards our opening night in mid October. Be sure to keep an eye out for more posts about our pro haunt developments and for other perspectives on it be sure to check out both Dr. Deaths Youtube Vlogs and GhoulishCops who will both be posting on the subject. We should be revealing the name of our haunt in time for the HAuNTcon Tradshow this year which we will all be attending so that is the first big date that we all look forward too! 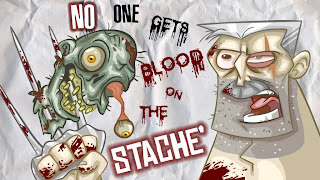 I have a few great in depth posts coming in the next few days all of which are in the works and currently being written but I wanted to give you something to gnaw on for a little bit and speaking of gnawing and biting what would be better than Zombie Murder Explosion Die! ZMED comes from the wildy insane minds of Jeff Campbell Creator and Artistic Director. Andrew Racho Director. And Finally, Scout Raskin Producer. Each has worked on various shows on both Nickelodeon and Cartoon Network and are now ready to tackle the Zombie Apocalypse! The trailer seems funny and the website already has some great content to sift through so be sure to check it out HERE!!! Enjoy the trailer below and keep and eye out (but don't forget to pop it back in!) for the series to hit in he new year.